Become a Shareholder in High Times – The Original Voice of Cannabis. Join our investor community and help shape the emerging cannabis industry through our Reg A equity crowdfunding IPO. Become a Shareholder in High Times – The Original Voice of Cannabis. Join our investor community and help shape the emerging cannabis industry through our Reg A equity crowdfunding IPO. 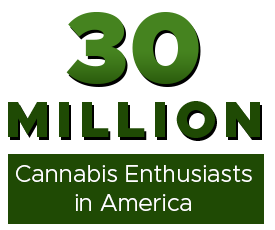 – Become a Shareholder in High Times – The Original Voice of Cannabis. Join our investor community and help shape the emerging cannabis industry through our Reg A equity crowdfunding IPO. High Times is fueled by the simple belief that the cannabis movement should focus on the community. That’s why we believe our expansion efforts should come from those who will benefit most from our growth—our loyal High Times fans, cannabis enthusiasts, and early investors. We also believe that owning stock shouldn’t only be for those with brokerage accounts. Through our stock offering, you can purchase shares of High Times for as little as $99 using your Credit Card or ACH and own your shares now before our planned listing on an exchange. High Times’ legendary print magazine, wise array of online platforms, and rapidly expanding Cannabis Cup festivals represent our quintessential brand—a trailblazer for cannabis culture that many have turned to for support, education, and a way to connect with the community since 1974. 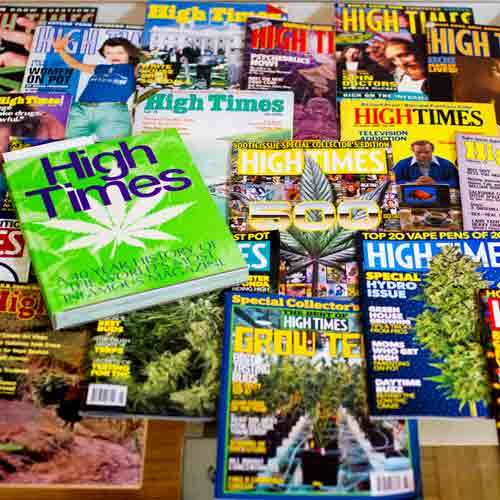 From cultivation to legalization, and entertainment to culture, High Times has been the preeminent source for cannabis information since 1974. Our events connect enthusiasts, advocates, businesses and policymakers, with the Cannabis Cup highlighting culture and our new Business Summit conferences focused on industry. From fashionable merchandise to cannabis courses, and cutting-edge media to rockin' events, the High Times brand has massive name recognition, and the possibilities are endless. When we took the reins of High Times, we saw the unique opportunity to take the iconic brand to the next level. 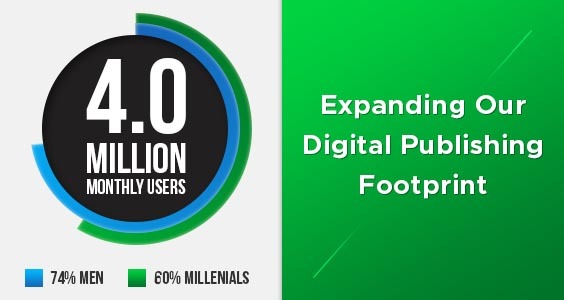 To get back to our roots as a cornerstone voice for the cannabis community, we’ve expanded our digital presence to build a strong following of nearly 10 million followers on our social media channels and over 150 million monthly impressions across our digital platforms. 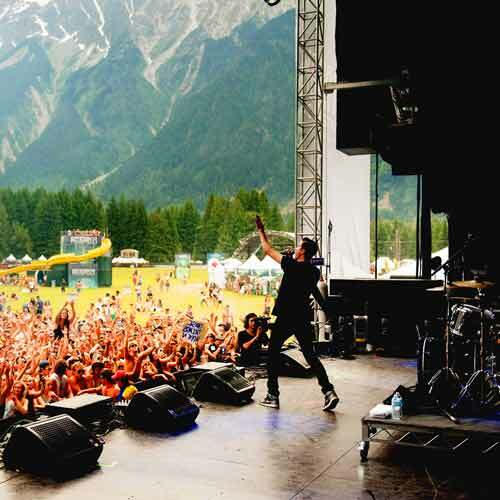 As we’ve been building a digital empire, we’ve also been quietly creating a robust music festival brand across the US and around the world, expecting 20 events globally next year. Our iconic Cannabis Cup festivals offer the ultimate cannabis experience, connecting the community at all corners and partnering with world-class performers from every genre. Cannabis connects people across generations, cultures, and demographics—and High Times is the bridge that brings the community together under one roof. With humble beginnings in 1974, we’ve traversed a tough landscape. 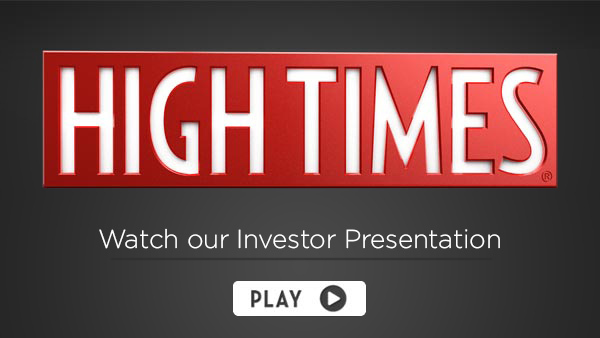 Now, we’re proud of the High Times name and the brand it represents, and we want you to take part in our success. We believe the High Times brand carries strong economic prospects and opportunity in the rapidly expanding cannabis markets. In California alone, cannabis is expected to be a $6.6 billion industry by 2020, with the US market projected to exceed $23 billion--a huge increase from $3.4 billion in 2015. 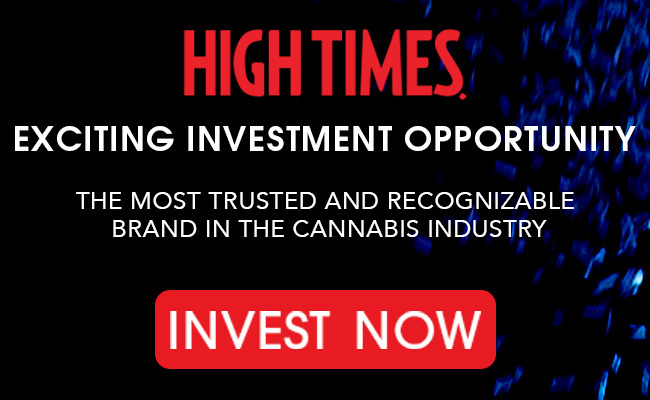 Despite a number of competitors entering the cannabis marketplace, High Times Magazine® has maintained its position as the premier publication and media creator for cannabis related content and information along with being a top cannabis-related company by market cap. 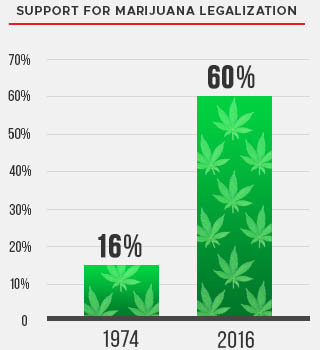 According to the 2017 Gallup Poll, public support for the legalization of marijuana in the United States has soared from approximately 16% in 1974 to approximately 64%. 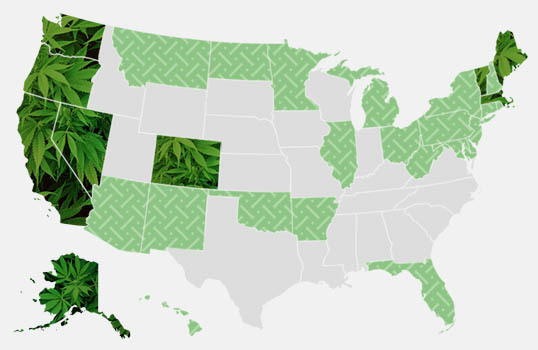 Medical cannabis is legal in 30 states, including Washington D.C., and adult cannabis use is either legal or decriminalized in 7 states. Hurry! Join Our Community of Investors Today! Due to our iconic history with the cannabis community, the High Times brand is ripe for monetization opportunities within brand licensing and ecommerce segments. International expansion of the High Times brand and platforms is set to continue with the sweeping marijuana legalization across the states and in other countries. To further our wide reach across the cannabis community, we’ve recently expanded and acquired new assets. HighTimes.com has more than 4.0 million unique monthly users, CannabisCup.com is the hub of our live events, and 420.com is an upcoming site that will sell cannabis related products. 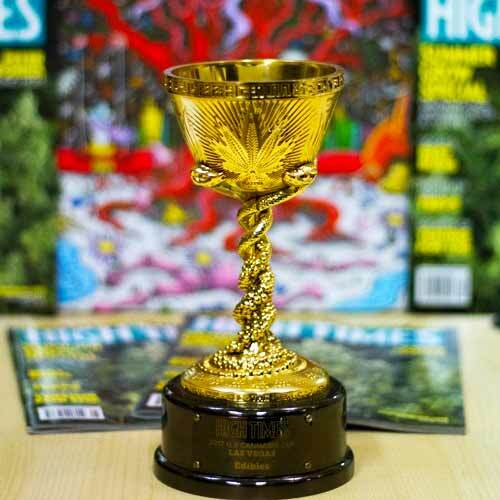 High Times’ Cannabis Cup™ is the world’s leading marijuana trade show. Each event celebrates the world of cannabis through competitions, instructional seminars, expositions, celebrity appearances, concerts, and product showcases. 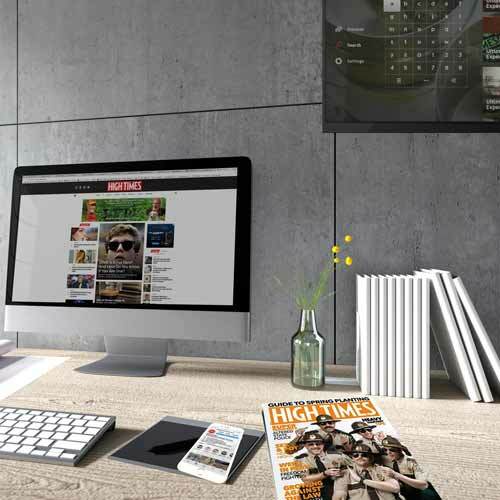 High Times Magazine© is a print publication that began in 1974 doing business as “HIGH TIMES®.” Since then it has published more than 500 issues with online publication of High Times Magazine© beginning in 2008. 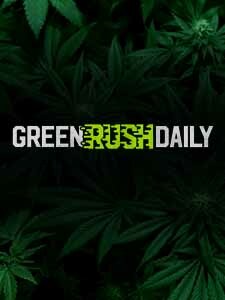 High Times recently reached an exclusive agreement to manage all online advertising sales for Green Rush Daily, an online publication providing daily news and information relating to cannabis, including guides, strain and product reviews, and health news. 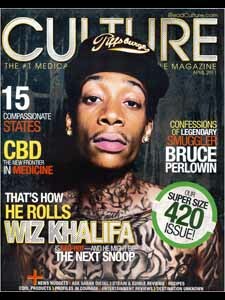 On June 9, 2018, we purchased assets from Culture Magazine™, a print and online magazine founded in 2009 that provides information and entertainment for medical-cannabis patients. 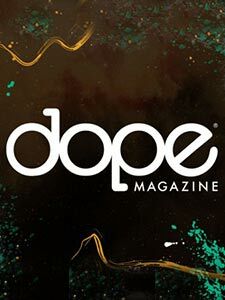 High Times recently brought Dope Magazine into the family, with a strong presence in the cannabis industry through print, digital media, and events. High Times’ vision is to continue representing the cannabis community, in part by cultivating the ultimate cannabis experience. 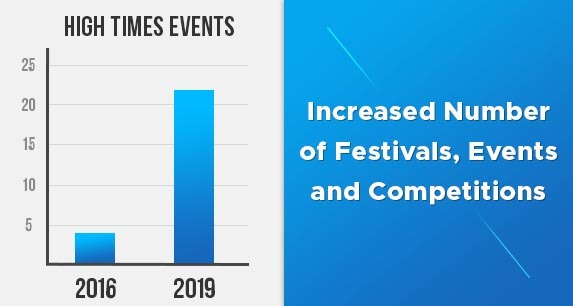 One part of that strategy is aggressively expanding our Cannabis Cup festivals across the United States and around the world as legalization spreads. We’re expecting to host ten festivals by the end of the year, and projecting more than 20 events in 2019. 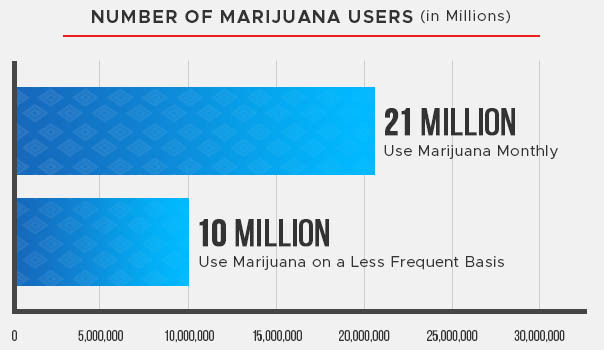 Another part of that strategy is building on our strong authority and presence online to shape how cannabis is seen and experienced around the world. There is such a rich culture with cannabis, and as this plant goes mainstream it will be important to maintain its roots. Our domain authority and SEO ranking with HighTimes.com and 420.com puts us in position to become a leading provider of cannabis content, and leading seller of cannabis products. 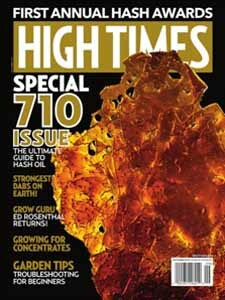 *Note: we do not intend to offer or sell cannabis on HighTimes.com or 420.com. We believe that investing in cannabis should be open to everyone, not just those with brokerage accounts. Through our stock offering, you can become an investor in High Times with just $99 using your credit/debit card or ACH bank account prior to our expected listing on an exchange. Check out our investor perks, ranging from a framed early-investor certificates to limited products and event opportunities. 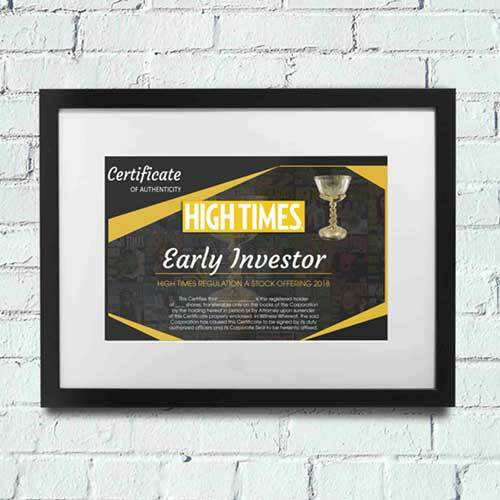 The framed custom-designed High Times stock certificate signifies your status as a High Times investor, and shows your vision for the growth of the cannabis industry. 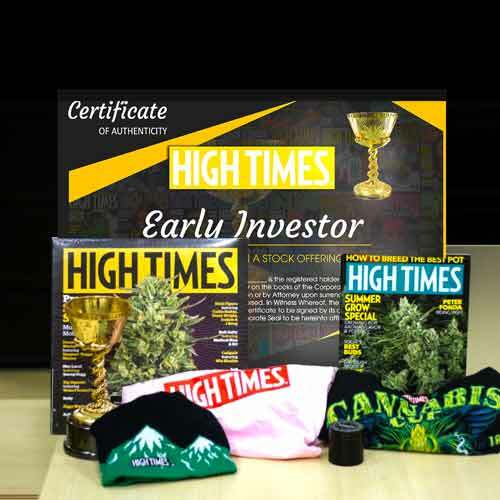 Our limited edition High Times poster, shirt and jacket will help you rock your investment, and represents your involvement with our early investor community. 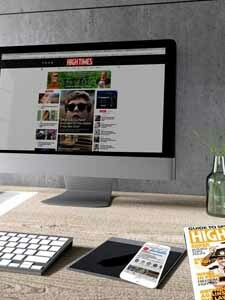 The ten-year subscription to the legendary High Times Magazine (print & digital) will keep you informed and involved as we continue to move forward and evolve in the dynamic cannabis space. 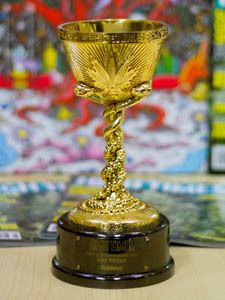 The limited edition Cannabis Cup trophy is designed by the famous Alex Gray for our special early investor community. Now is your chance to take part in the Cannabis Cup legacy with High Times. 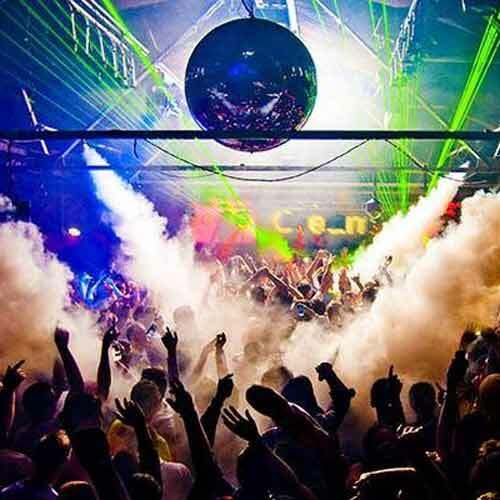 Enjoy an all-expenses-paid VIP trip to the Amsterdam Cannabis Cup event for two (2). Come to experience our cult classic in the heart of Amsterdam as our Super VIP. 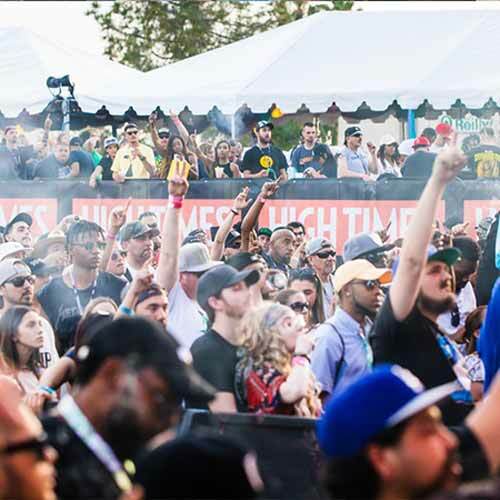 Cement your status in the High Times legacy with lifetime Cannabis Cup Super VIP access to all future events. Ensure your permanent VIP status for our expanding Cannabis Cup festivals around the world. Adam is the founder and Managing Director at Oreva Capital. He has a passion for helping companies accelerate through strategic business development and execution of M&A strategies. He has deep expertise in the fields of mobile, social networking, entertainment and venture capital. Adam is a featured speaker at CES, MIPTV, MONY Conference, CTIA, Wireless Influencers, and has been featured in The Wall Street Journal, The NY Times, Fortune, Bloomberg and Entrepreneur Magazine. He has appeared on CNN, NPR, MSNBC, HBO and Fox News. David is a corporate finance executive and CPA offering over 20 years of experience building, leading, and advising corporations and start-ups through complex transactions, operational set-up, restructuring, expansion, and capital/investor markets. He also has a strong background in mergers and acquisitions, and knowledge of SOX requirements. He has good banking relationships which have allowed him to structure and negotiate transactions and favorable terms with commercial and investment banks. Sameen Ahmad has been with High Times for over 2 years and serves as the Vice President of Events. She manages and produces High Times events from top to bottom around the country. Sameen has previously produced festivals including Austin City Limits and Life is Beautiful for over a decade. She has a masters in finance from Columbia University. She worked as an investment banking analyst with the Blackstone Group and later joined the global expansion team for Starwood Hotel & Resort's W and St. Regis spa division. Along with being a huge fan of the New York Football Giants and a former fencer, she loves to travel and use all of the 6 languages learned over the years. Since October 2016, Mr. Conway has been a managing director of Oreva Capital Corp., a Los Angeles based merchant bank focused on making direct investments in diversified, private operating companies. Justin Ehrlich is a partner in VE Equities LLC, a full-service real estate company, and Churchill Real Estate Holdings LLC, a platform offering short term debt products. He has completed over $10 billion of luxury real estate projects in Manhattan and is developing several more in California. Ehrlich is currently on the board of A Caring Hand and BDS Analytics. Eleanora Kennedy has been on the board of High Times for the past four decades and has been a consultant to the company for just as long. Additionally, she is a published writer and accomplished interior designer. She is known for her charitable causes and is a board member of the Society of Memorial Sloan Kettering Cancer Center. Colleen Manley has served as a director of High Times Holding Corp. since March 2017 and for the past five years has served as a director of Trans-High Corporation. 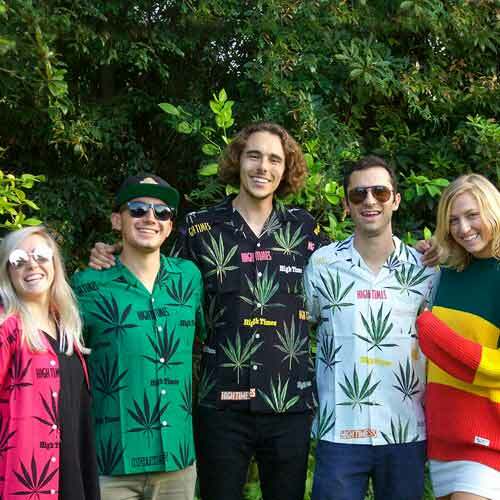 Prior to his tenure at HighTimes, David was the Director of Digital Operations at Sock Panda LLC where he grew revenues through corporate partnerships with Facebook, Girl Scouts of America and Amazon. He is responsible for driving a charitable program in conjunction with the department of Veterans Affairs to supply socks to homeless veterans across the United States. During his time at Sock Panda the company was covered by the New York Times and BuzzFeed. Prior to Sock Panda David was the Manager of digital networks for Sony Pictures Television (SPT). In this position, he was responsible for negotiating distribution deals and managing relationships with partners on behalf of Sony for acquisitions, programming, marketing and operations for Sony's digital video services in the US, Canada and Australia. Additionally, he supervised and managed the OTT applications business for the Studio which includes integrations with Roku and TiVo. David holds an MBA from USC and a Bachelor’s Degree from Brown University. David is a native of Los Angeles where he lives with his wife and son. How do I invest in HighTimes Holding Corp (High Times)? 3) Select "Company" or "Individual"
Please, make sure to read the offering circular (here), which details all the terms of this offering, before making an investment. What is the investment minimum? The minimum investment is nine shares, which amounts to $99. Investment perks kick in starting at $420, so be sure to check them out. What methods of payment are allowed? We accept Credit Card, ACH and wire. What is the cut-off date for this offering? We do not have a set close date for our Regulation A+ offering as of yet. The offering can be extended until March 31, 2019, at our sole discretion. However, if all 4,545,454 shares are sold before March 31, 2019, then the Offering will terminate on the date that the final share is sold. 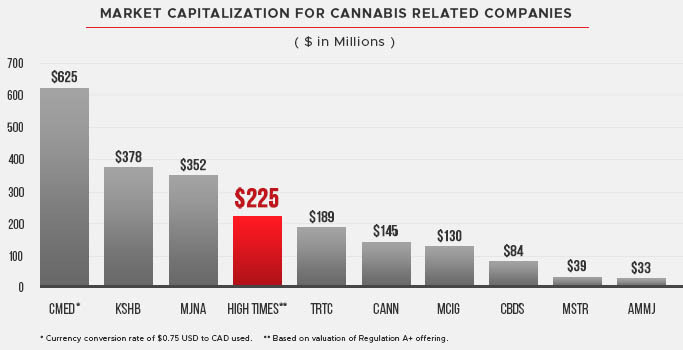 How much capital is High Times looking to raise? We are offering up to 4,545,454 shares of our Class A Common Stock for up to $50,000,000, at an offering price of $11.00 per share. What is a subscription agreement? A subscription agreement is a legal contract between you and High Times to purchase shares. This purchase of stock is a one-time event. No recurring payments will be withdrawn from you. Funds from this offering are being used for continued corporate operations, growth, and expansion. Please, visit our ‘Opportunity Section’ in our offering curricular for more details on our plans for the future. Do I have to be a U.S. citizen or live in the U.S. to invest? No, our offering is open to international investors as well. Is there a market for trading my shares? We are presently in the process of applying to have our stock listed on an exchange under the ticker symbol “HITM.” The application is currently under review and we are actively working to answer any questions it may have. However, there is no guarantee that we will be successful in obtaining an exchange listing. What happens after I invest? After escrow closes, the shares will be issued to you via V-Stock, our transfer agent. At that point, you can transfer them to your brokerage account or have them delivered to you. We will also keep you updated via email and social media with important updates throughout the campaign so be sure to stay connected. Will High Times list on a public exchange? We have applied to be listed on an exchange under the ticker symbol “HITM” in success of our Regulation A+ offering. Once the offering closes, how do I go about transferring my shares to my brokerage account? After the offering closes, the shares will be issued to you via V-Stock, our transfer agent. Can I sell my shares in the future? Yes, you can sell your shares to private parties. We’ve also applied to have our shares listed on an exchange. If we are successful in obtaining an exchange listing, you would then be able to trade your stock freely. However, there is no guarantee that we will be successful in obtaining an exchange listing. There is no lock-up period for the shares you are purchasing in this offering. What happens if I do not have a brokerage account? If you do not have a brokerage account, you can open one with online brokerages such as TD Ameritrade or E-Trade. You do not need a brokerage account to buy shares, but you will need one if you want to trade them. How do I contact High Times? For any questions about our offering, please reach us at [email protected]hightimes.com, or call us at (323) 609 7631. You can also message us on the site. What is the Jobs Act? The Jumpstart Our Business Startups (JOBS) Act was signed into law by President Barack Obama on April 5, 2012, to encourage funding of small businesses by easing various securities regulations. The JOBS Act required the Securities and Exchange Commission (SEC) to adopt rules to implement a new exemption that would allow businesses to accept contributions from private individuals without making an initial public offering. What is Regulation A+ equity crowdfunding? In June 2015, the final "Regulation A+" rules under Title IV of the JOBS Act became effective, after approval by the SEC, paving the way for companies like High Times to solicit their raise of up to $50 million from both accredited and non-accredited investors. What does it mean that the SEC has qualified this offering? "The SEC has qualified this offering" means the SEC has permitted Hightimes Holding Corp (High Times) to offer for sale the securities described in the offering circular to investors such as you. The SEC is not judging the merits, accuracy, or completeness of the offering and information in the offering circular. Rather, the SEC is merely ensuring Hightime Holding Corp. has met federal legal disclosure and regulatory requirements necessary to make these shares available to you. Who can invest in a Regulation A+ offering? Anyone, accredited and non-accredited investors alike, are eligible to purchase securities in a Regulation A+ offering. What is the difference between an accredited and a non-accredited investor? An accredited investor is an individual who makes over $200,000 per year ($300,000 if combined with a spouse) or who has a net worth of $1 million or more, excluding their primary residence. A non-accredited investor is anyone who does not meet the net worth requirements for an accredited investor. How much money can I invest in a Regulation A+ offering? Non-accredited investors can invest up to 10% of the greater of their annual income or net worth. There are no restrictions for accredited investors. I am having trouble entering my information on my mobile device, is there anything I can do? If you’re having difficulty inputting your information via mobile, we recommend completing your investment on a desktop computer or laptop. Why does my status in my profile, "Not Received” after I purchased shares and my ACH payment has been processed? Your investment is in progress. Our plan is to process all investments together in bulk before the offering closes. At that point, the status on your investor dashboard will update. We have partnered with Fund America, the leading investment transaction engine, so that you may safely and securely invest on our site. We are in the process of issuing shares - refunds are no longer being issued. The forward-looking statements used in our Offering Circular and on our Website are only predictions. We have based these forward-looking statements largely on our current expectations and projections about future events and financial trends that we believe may affect our business, financial condition and results of operations. Because forward-looking statements are inherently subject to risks and uncertainties, some of which cannot be predicted or quantified, and many of which are beyond our control, you should not rely on these forward-looking statements as predictions of future events. The events and circumstances reflected in our forward-looking statements may not be achieved or occur and actual results could differ materially from those presented in our forward-looking statements. No assurance can be made to any investor by anyone that the expectations reflected in our forward-looking statements will be attained, or that deviations from them will not be material and adverse. These forward-looking statements speak only as of the date of this hereof. Except as required by applicable law, we do not plan to publicly update or revise any forward-looking statements contained in our Offering Circular or on our website, whether as a result of any new information, future events or otherwise, other than as may be required by applicable law. For further information, please see the Company’s Offering Circular on Form 1-A HERE. Copyright © 1974- Become a Shareholder in High Times – The Original Voice of Cannabis. Join our investor community and help shape the emerging cannabis industry through our Reg A equity crowdfunding IPO.